The deal has been agreed, subject to Parliament. Mrs May now has the uphill task of selling the deal to MPs. The overwhelming majority who have expressed an opinion including both Remainers and Brexiteers have condemned it. As has President Trump. She will be praying for no further asides from him at the G20 in Buenos Aires. The vote is scheduled for 11 December, after a five-day debate. The Government’s tactic is to rely on Mrs May’s deal being the only one on offer, the alternative being the supposed abyss of a no-deal. The risk to this strategy is that Brexiteers expose the choice as being false and that Mrs May should go back to Brussels and renegotiate. The EU stands ready to reaffirm they will not accept any other deal to cut off this option. The Treasury and the Bank of England have cranked up their economic and financial models again to forecast maximum disruption in the event Parliament fails to support Mrs May’s deal. However, in the Commons, the Treasury backed off from its responsibility for its post-Brexit forecasts, saying it was based on analysis involving a wide range of government departments. One is left wondering why the Treasury Secretary felt unable to give it his wholehearted support. The Bank of England has been less delicate in its approach, by claiming we are all doomed. The result after only one day of airing its forecast is a loss of public credibility for the Bank and particularly for Mark Carney, its Governor. The frighteners extend to a hodgepodge of claims of many things vital to life and employment, put together by government quangos. Shortages of medicines, transport disruption, chemicals for water purification and many more are all documented in eighty different official papers. The deceit is to assume these supplies are provided at an inter-governmental level, and not by profit-seeking businesses, which would surely do everything in their power to secure continuing sales. The Port of Calais is expected to cut off its nose despite its face and turn away traffic. This line of propaganda seems to be an irresistible line of attack for the Government, accustomed to frightening the populous into a preferred course of action. This is despite the failure of this tactic ahead of the Brexit referendum, when the public decided it was a stinking rat. What is the deal, and why the fuss? Britain leaves the EU on 29 March next year and under Mrs May’s plan enters an implementation period when there is no change in current trade arrangements, until at least 1 January 2020. After that, if the trade agreement is not in place (highly unlikely – it takes years to get the EU to agree to trade deals), Britain can either extend the implementation period for a time, or the backstop on the Irish border will be implemented. The agreement states that both the EU and the UK will use best endeavours to reach a trade agreement. But given it can be blocked by EU member countries which are not a party to the agreement, this reassurance must be worthless. Even before the ink was dry, Spain forced concessions on Gibraltar, and President Macron of France made it clear France would withhold its consent to a trade agreement if French fishing vessels were denied fishing rights in British waters. The problem with the agreement is that by not agreeing, EU member states can ensure, in the words of Boris Johnson, Britain remains a vassal state. Worse than that, with this agreement it is a zombie state, a walking-dead captive of the customs union. Even the Remainers don’t like it, because it is as plain as a pikestaff that Britain is in a far worse position with this agreement than it would be remaining in the EU. It is chained to the customs union with no influence over the regulations imposed upon it. Accordingly, Remainers of all parties are united in the call for a second referendum, which they hope will reverse the first, allowing Britain to remain as a full member of the EU. But to concede a second referendum would be unprecedented, and also an admission of failure by the government. Furthermore, it would take months to go through Parliament, time which it does not have. With no practical alternative, many prominent Remainers are expected to vote against the agreement. For the Brexiteers, it is already an admission of failure, particularly since the Prime Minister always refused to consider a Plan B. Britain has agreed unconditionally to pay the EU £39bn as the divorce settlement and will continue to pay into Brussels the annual tribute of roughly £9bn until the new trade terms are agreed and implemented (which could be never). While the agreement generally limits the European Court of Justice’s powers to adjudicate on trade and related matters, it means Britain does not have control over future trade arrangements during implementation and backstop periods, and it will be impossible for Britain to strike her own trade deals until that time has passed. Hence President Trump’s remarks. We have confirmation it is Hotel California: you can check out but never leave. The deal is so unpopular that already the media are saying it will never get through Parliament. The Daily Telegraphhas aggregated various sources of information to estimate 221 MPs will vote for it and 418 against. But much can change in a short fortnight. Let us look at it from Downing Street’s point of view, to try to understand the Government’s strategy. 96 Conservative MPs have said they will vote against, out of a parliamentary party of 314 (excluding Speaker Bercow). The Democratic Unionist Party, with ten MPs who provide the Conservatives with their slim Commons majority, have also vowed to vote against it. The Labour Party with 257 MPs have said they will vote against it, but there are perhaps 60 Labour rebels. The Scottish National Party has 35 MPs, who will also vote against it. Liberal Democrats, with 12 are probably against it, but may not be united on the threat of no deal. That leaves 216 Conservatives likely to support the Government (including 94 Ministers), perhaps 240 after the whips have done their work. 74 MPs from the other parties are then required, at least 60 of which must be Labour MPs. It is worth recalling that 64 Labour MPs defied the Labour whip over an amendment tabled to remain in the customs union last December, close to the number of Labour MPs required to rebel this time for Mrs May to win the vote. And that’s assuming Labour isn’t persuaded to abstain, which would guarantee Mrs May gets it passed by a comfortable margin. Clearly, the key to success is Labour’s intentions, which is why Downing Street is wooing their MPs. However, two weeks ahead of the vote, talk of a heavy defeat for the government looks, on Downing Street’s likely assessment, wide of the mark. All this assumes Labour will resist the temptation to topple Mrs May and create havoc for the Tories. That is a big assumption, because it is definitely in Labour’s interest to defeat the government to see what opportunities might arise. Consequently, while the Downing Street assessment may turn out to be too optimistic, the Brexit camp cannot afford to be complacent. The Brexiteers will concentrate on mustering as much support as possible to reject the proposed agreement. They already have the ten DUP members on side, and 96 Conservatives who have said they will vote against. They need to work on the other 218 Conservative MPs, of which 94 are ministers, leaving a pool of 124 possible votes. It would help their case enormously if more Brexit-supporting ministers resigned from the government ahead of the vote, so they are likely to be privately encouraged to do so. This would benefit the Brexit cause by fatally undermining the Government’s claim that the agreement is in the spirit of Brexit. Brexiteers will also have to build cross-party alliances. Above all, they must come up with an alternative strategy acceptable to both Brexiteers and Remainers to force the Government to return to Brussels for better terms, despite Brussels saying the only alternative is no deal. To achieve the necessary parliamentary support, Brexiteers are likely to focus on the least contentious issue, being the failure to achieve total parliamentary sovereignty in the draft agreement. Even Jeremy Corbin and others on the far left of the Labour Party can agree on this, because they want to be free from all Brussels regulations so that they can nationalise and subsidise unionised industries. Sovereignty is the one issue the Government cannot argue convincingly, which is why it deflects the issue into one of taking control of immigration. The economic effects, which are a transitional problem, are less important to the bigger picture, but are more immediate to the electorate. For these reasons the Government is focusing on the economic effects, promoting hypothetical problems that grab the headlines and divert attention from the sovereignty issue. The scope for half-truths and downright deception is enormous and is being exploited by both the Government and allegedly independent analysts. In the last few days, we have been told that stockpiling food has left Amazon short of warehouse space. This follows earlier assertions from Barclays Bank research that extra tariffs on food and drink imports could cost £9.3bn per annum, leading to higher food prices. This must assume the Chancellor imposes, Trump-like, yet higher import tariffs on food than the ones being dropped on a no-deal Brexit. It might assume sterling will crash (we’ve heard that one before) but ignores the possibility the euro will fall even more. These scare stories are easy to counter and should be given no credence, but the media is always more likely to take as gospel truth the information spoon-fed to it by background government briefings, while questioning reasoned argument from Brexiteers with relative scepticism. 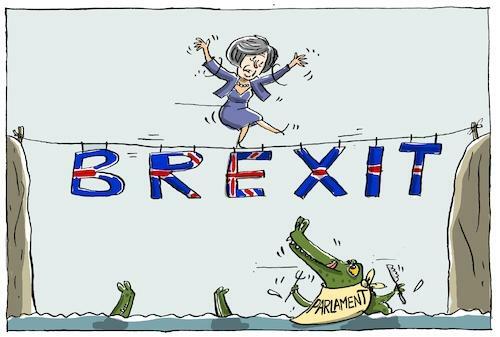 Press reports suggest that Downing Street believes that if the vote is not passed, Mrs May could probably survive if it is rejected by less than a hundred votes. Any more than that, and she is toast. This is probably too simplistic, and ignores the fact that David Cameron immediately resigned when he lost the Brexit referendum, irrespective of margins. It also relies on the ten DUP MPs continuing to give her a majority, which they have already withdrawn. If she relies on Labour votes, having failed to get sufficient support from her own party (which Downing Street is already doing), she will be ejected whatever the outcome. For the moment, everyone is being very polite, saying she has admirable qualities of perseverance and determination against all odds. And don’t we all love a fighter. This can rapidly elide into being pig-headed, domineering and deliberately misleading. Act too early, and MPs who wish to ditch her will be accused of disloyalty and naked ambition. Furthermore, Brexiteers do not have control of the agenda. For these reasons, rival candidates for the leadership remain in the shadows. But they will be watching for that change of emphasis, which is likely to come in the wake of the Commons vote, if not before. The only way Mrs May can save herself and the integrity of the Conservative Party is to cancel the debate and tell Brussels it simply won’t wash. She must remind them of the consequences of their rejection of David Cameron’s demands, and tell them they will have to come up with better terms, otherwise it is no deal. Will she do it? We shall see. She has some leverage, if she can understand it. Brussels is bust and needs money urgently. The knock-on effects of a no deal might be unpredictable for the UK, but, and this is the point few have taken on board, it would be catastrophic for the EU.